Our client, Debiopharm Group, transforms promising molecules into innovative therapies. Founded in 1979 and headquartered in Lausanne, Switzerland – Debiopharm’s main area of expertise is oncology, but they also develop medication in therapeutic areas such as immunology and infectious diseases. For your easy reading, we have divided this report into three parts. An offer regarding a cross trade shipment for pharmaceutical goods. Advice about the most appropriate isothermal packaging solution. The Brief: maintain pharmaceutical goods at a guaranteed temperature range of between 2-8° C, from departure in Austria to arrival in the USA. What is cross trade shipping? Cross trade shipping is the transportation of goods between two countries, outside of the country where the client (the paying party) is located. Isothermal packaging, also referred to as insulated shipping systems, are solutions that conserve goods at a particular temperature for a specific period of time. A competent shipper will dedicate his expertise to choosing the optimal system, based on a client’s exact specifications. To learn more about packaging, please read our How to get cold chain shipping right tutorial. Your bonus: an easy to use Shipping Profile Checklist (infographic), ready for download and print. What is a Cold Chain? As the handling and transport of temperature sensitive substances is becoming more tightly regulated worldwide, cold chain is a highly sought-after service. Typical users are in the life sciences field: biomedical companies, hospitals, research laboratories, and also in the food industry. Resources (such as isothermal packaging). Reporting (such as temperature logging). Its aim is to keep substances at a guaranteed temperature range whilst transporting them from destination A to destination B. Cold chain systems can be very complex, requiring impeccable planning and disciplined implementation by experienced shippers. Check out our Cold Chain Tutorials series which include practical infographics for download and print. We provide ready to use check lists covering must-have data such as temperature, product volume, transit times, and more. NV Logistics is experienced and fully equipped to execute cross trade shipping. Internal expertise is backed up by collaboration with worldwide partners, judiciously chosen for their know-how in the biopharmaceutical/life sciences environment. Amongst others: World Cargo Alliance (WCA) and SFS Pharma Logistics. When a customer places a cross trade shipping order with us, we coordinate (on behalf of the client) the shipment from A-Z. Each step is documented and communicated to the client’s internal project manager. For this specific project, goods needed to be moved from the departure location in Austria to Vienna airport. We interacted with and monitored activities with both the local packaging supplier and the local shipping representative. Once arrived in the US, our local shipping agent welcomed the goods at the airport, monitored the import formalities and moved the goods from the airport storage to the final client destination. 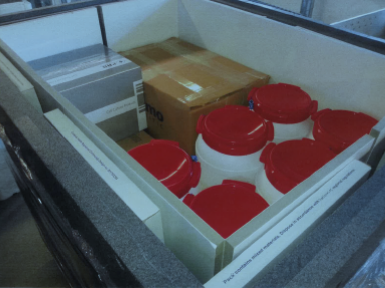 The Debiopharm shipping brief required a guaranteed and validated temperature range of between 2-8º C. In other words a non-interrupted cold chain between Austria and the USA . Debiopharm goods to be cold-chain shipped by NV Logistics. Based on the client’s described needs, we evaluated several solutions and submitted our preferred choice – fully documented – to Debiopharm for their approval. ©Laminar Medica Insulated shipping systems. *The destination point being North Carolina, the average temperature range of that location at that specific season made us choose the Summer configuration. Want to learn more about Laminar system assembly? View this video – and/or download this PDF. NV Logistics’ internal decision processes are based on experience, technical know-how and predefined checklists. Download our temperature checklist, for your immediate practical use. We strive to provide the safest solution at optimised cost/performance ratios. Each isothermal packaging system comes with its own (sometimes complex) instruction set. The availability of competent packaging staff is, therefore, essential. 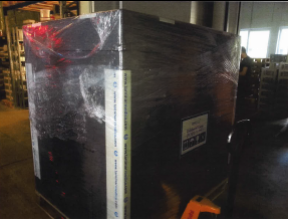 The packaging system – ordered by NV Logistics on behalf of the client – was sent to the departure point in Austria in good time. A Controlled Room Temperate (CRT) storage space and a freezer was provided. Both are integral parts of the isothermal packaging solution. For optimal cold chain shipping, time is of the essence. We ensured that documents such as bills of lading and pro-forma invoices strictly conformed with the regulations of the importing country. We have an attitude to shipping documents that could be qualified as a little pedantic 😉 but our zeal is usually rewarded! We consistently achieve highly performant import events. For Debiopharm, we submitted initial drafts to our importing agent in the USA who suggested a few minor changes, thus ensuring smooth customs clearance. Debiopharm’s internal staff duly reissued revised documents which we forwarded to our local agent (USA) for final approval. We then received the “OK to ship”. 3. Product temperature integrity proof. 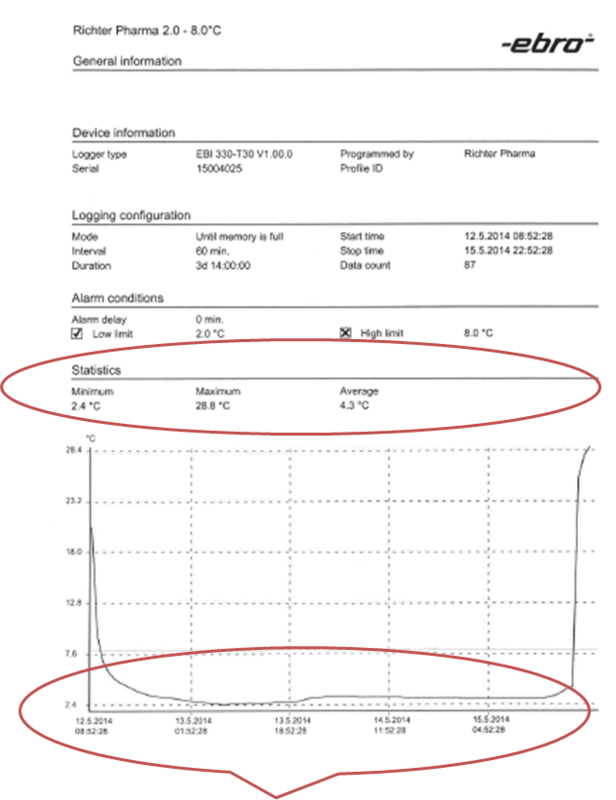 An essential component of cold chain transport is the monitoring of temperature levels throughout the journey. Monitored data in the form of temperature charts is being delivered to the client at termination. But if the client so desires – we’re fully equipped to provide live monitoring during the journey. For Debiopharm, we ensured that the local representative at departure point in Austria embedded adequate temperature logger devices. Our agent in the USA arranged for the recuperation of the temperature logger devices. He made sure that the data logger reports were ready as soon as the shipment was delivered to the client’s location. Hence the client had immediate access to crucial cold chain data which, in the end, determines the shipment’s success. NV Logistics takes care of everything! This is the concluding message (after delivery was completed) we received from Debiopharm’s project manager. Thank you very much for your message and your exceptional service concerning this shipment. For cold chain shipping to be successful, all components must be “just right”, and each individual professional who is part of the chain needs to do “the right thing”. We like to compare ourselves to a conductor of an orchestra. A symphony touches our heart if each individual artist is given the chance to shine – so that each single action becomes an exceptional part of an exceptional outcome. At NV Logistics we take the trust our clients bestow on us very seriously. One of the best ways to earn trust is complete transparency. This starts with ongoing and clear communication during the whole shipping journey. Here are 2 examples of how we communicate. 1. Photo sent to Debiopharm’s project manager in Lausanne. “Thank you very much for this reassuring update. I will also take advantage of your nice photos to provide the recipient with an idea of the volume this package represents”. 2. Arrival announcement sent to goods’ recipient in North Carolina (USA). “Just wanted to confirm that the shipment is in good order and in route to you. With the rain and storms that have been in the area they are anticipating arrival between 13h30 and 14h30 this afternoon. 3. The following report, rendered by the two data loggers, was subsequently sent to the client. kindly provided by Flickr and photographer Martin.